Try to think of a time in your life when you felt like you were perpetually confused. For some of us, that might come at almost any age. But, for those lacking the benefit of life experience, it most likely occurred at a time when we were still finding our way in the world – not when we were so young that we didn’t consciously think about such things but at a slightly later stage in our development when we earnestly began trying to understand our place in the realm of existence. If most of us were to apply that standard, that incessantly awkward, unceasingly confounding time probably came in our early teens, a time when we were no longer children but not quite adults, a time aptly depicted in writer-director Bo Burnham’s debut feature, the delightful and edgy new comedy-drama, “Eighth Grade” (web site, trailer). Kayla Day (Elsie Fisher) walks through life lost. The 13-year-old is on the verge of completing middle school and preparing for high school. She desperately seeks to carve out a niche for herself, but her efforts never quite seem to work out the way she would like. As a sensitive but shy wallflower type, Kayla bravely tries to put herself out there, pursuing such undertakings as recording heartfelt but nervously meandering advice videos for her own online TV channel. She forces herself to try and make friends with others, but she’s often met with disdain from the supposedly cool kids, who constantly look down on her, or indifference from the junior high hunks, who only self-servingly see her as a prospect for a quick score. And, to complicate matters, she must also contend with the stress-inducing anxieties of “the new normal,” such as participating in active shooter drills at school, something those of us a little further on in years never had to deal with when we were that age. What’s a contemporary girl to do? 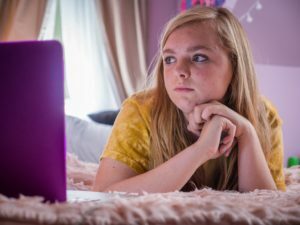 Teenager Kayla Day (Elsie Fisher) seeks to make a name for herself by recording advice videos for her own online TV channel in the delightful and edgy new comedy-drama, “Eighth Grade.” Photo by Linda Kallerus, courtesy of A24. “Eighth Grade” follows Kayla through the trials and tribulations of navigating this reality, as seen through such incidents as her reluctant attendance at a birthday party for a severe, cliquey diva (Catherine Oliviere) and her first time in the back seat of a car with a boy (Daniel Zolghadri), one whose intentions are less than honorable. Viewers witness her various ways of coping, from proactive steps, like making lists of what she hopes to achieve, to desperate measures, such as unwittingly succumbing to a bout of hyperventilation. She’s obviously doing the best she can under the circumstances, but it’s far from easy, especially since she lacks the experience to know how to respond. This is not to say that Kayla’s all on her own. She has a staunch supporter in her father, Mark (Josh Hamilton), a somewhat goofy, always well-meaning, supremely loving single parent who’s awed by her moxie and her willingness to put her feet to the fire, a courageous streak that she doesn’t always recognize in herself but that make it easy for dad to give her a long leash. She also befriends an older peer, Olivia (Emily Robinson), a bubbly mentor whom she meets while attending a high school orientation program. But, again, given Kayla’s inexperience in knowing who to trust and what advice to embrace, she often founders about, trying to figure out what to do and which guidance she should take to heart. 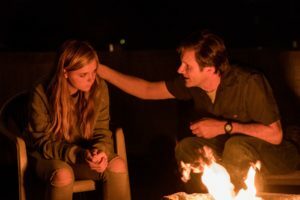 Insecure teen Kayla Day (Elsie Fisher, left) shares a moment with her somewhat goofy but ever-supportive father, Mark (Josh Hamilton, right), in writer-director Bo Burnham’s debut feature, “Eighth Grade.” Photo by Linda Kallerus, courtesy of A24. One can’t help but feel for Kayla. Those of us a little long in the tooth know what it means to go through such ordeals. Even though some of them may seem comparatively trivial to those of us who left such problems behind long ago, we may nevertheless have sweat bullets about them when we went through them, even if we have subsequently lost sight of how truly traumatizing they can be. Kayla’s story reminds us of the anguish our younger kindreds can experience as they work their way through their own personal learning curves – and of the need to show them compassion during such a crucially formative transition. Thanks to the film’s masterfully written script, “Eighth Grade” effectively embodies a certain universality of what it’s like to go through that stage of life. What’s more, given its contemporary time frame, it also captures the ever-changing unease that all of us may experience these days, regardless of our age, as we attempt to cope with the constantly shifting sands of prevailing conditions beneath our feet. Considering the foregoing, these twin truths give us pause to contemplate what it must be like for someone Kayla’s age to be experiencing them simultaneously, a prospect many of us probably wouldn’t envy once we think about it. Geeky teen Kayla Day (Elsie Fisher, left) makes a new friend in her bubbly mentor, Olivia (Emily Robinson, right), at a high school orientation program in the new comedy-drama, “Eighth Grade.” Photo by Linda Kallerus, courtesy of A24. Burnham’s initial feature effort is a flat-out winner. 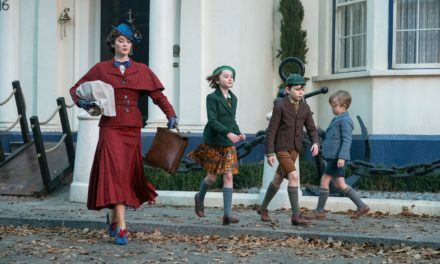 Despite a slight tendency toward being episodic, this insightful look at growing up at an ungainly time in one’s life at an unnerving time in history wins the day with incisive humor and an ever-present though reluctantly acknowledged edginess that speaks plainly to viewers of any age. 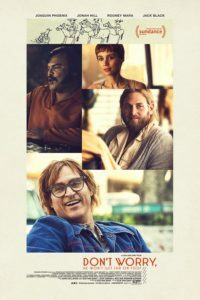 Newcomer Fisher delivers a knock-out performance as a 13-year-old playing a 13-year-old, backed by a terrific ensemble of supporting characters who help to bring out the best in her portrayal. In all, you won’t regret your time at the theater with this one. Finding our way in life can be challenging at any age but especially so when we lack the wits to know what to do – and discovering that the only effective way to amass those coping mechanisms is to go through the experiences that provide them, difficult though they may be. We can only hope we succeed in our efforts. 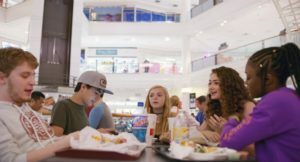 Thirteen-year-old Kayla Day (Elsie Fisher, center) nervously seeks to make friends with a group of older peers (from left, Fred Hechinger, Daniel Zolghadri, Emily Robinson, Imani Lewis) in the delightful and edgy new comedy-drama, “Eighth Grade.” Photo courtesy of A24. We’ve all heard about the metaphorical notion of making lemonade when life unexpectedly hands us those tart little yellow orbs. The process is seldom easy, either, particularly when we’re deluged with vast quantities of lemons or when their juices are especially sour. But it’s indeed possible to turn things around, provided we apply ourselves and see that life can still have meaning when everything appears potentially lost. 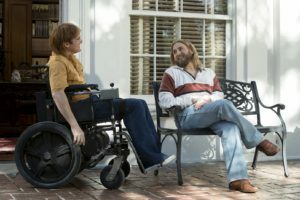 So it was for a recovering alcoholic paraplegic seeking to pick up the pieces of his life in the new fact-based biopic, “Don’t Worry, He Won’t Get Far on Foot” (web site, trailer). 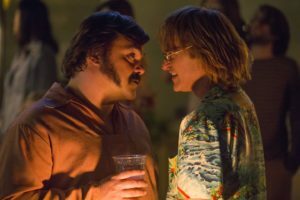 For years, John Callahan (Joaquin Phoenix) lived to drink. He held down various mundane jobs to acquire the cash he needed for his frequent visits to the liquor store. And, by night, he routinely sought out invitations to parties at which he would binge on into the wee hours. Waking up immobilized in a hospital, John was forced into coming to grips with his new reality. Faced with circumstances unlike anything he had ever encountered, he now had to make plans for what to do for the rest of his life. John’s most immediate priorities were attending to his injuries and learning how to adapt to his new physical condition, a process that, though challenging, seemed to go better than what one might expect. But the emotional side of his ordeal was another story. Fortunately, John had a supportive team of caregivers working with him, most notably a kindly therapist, Annu (Rooney Mara), with whom he developed a professional relationship that had decidedly personal overtones. 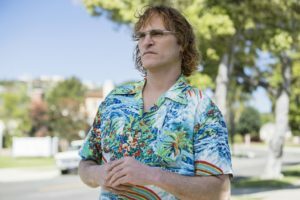 He also began attending Alcoholics Anonymous meetings at which he met a sponsor, Donnie Green (Jonah Hill), who welcomed John into his group therapy circle. And it’s there where the real work began. John struggled with staying sober, because group therapy forced him into some difficult personal work – discovering why he began drinking to the point of incoherence in the first place, a practice that started in his teens. 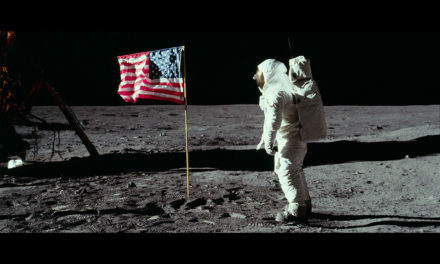 However, despite this arduous task, answers started coming to him as he worked his way through the program’s 12 steps. He gradually began purging his personal demons, making it possible for him to remain free of drink. One of the most important steps of this process, though, was figuring out what to do with himself. Having retained partial movement in his arms, John discovered a knack for drawing, particularly cartooning. He had a distinctive style, to which he added his singularly outrageous wit, a scathing sense of humor that took no prisoners and frequently caused offense. However, many found his sketches refreshing, hilarious and insightful, qualities that soon earned him widespread recognition and publication in numerous high-profile periodicals. The lemonade was at last flowing. Environmentalism and religion may seem an unlikely duo, yet two new films explore the emergence of this curious new alliance. 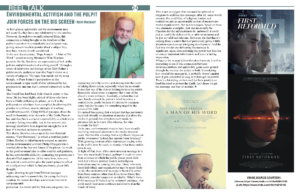 Find out more by reading “Environmental Activism and the Pulpit Join Forces on the Big Screen” in the latest issue of Up Words magazine. 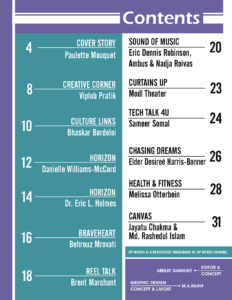 Find out how to access the entire issue at the publication’s Facebook page.